"Felix, Bishop of Portua, a man of holy life, who was born and brought up in the province of Sabina, saith that there lived in that place a certain nun, which, though she were chaste of her body, yet had she an ungracious and foolish tongue. Having departed this life, she was buried in the church, the keeper whereof, the night following, saw her by revelation brought before the holy altar, where she was cut in two pieces, and the one half was burnt in the fire, and the other was not touched at all. Rising up in the morning, he told others what a strange vision he had seen, and showed them the very place in which she was burnt, the marble whereof appeared with the very marks and signs of a fire upon it, as though that woman had been there burnt in very deed with corporal fire. By which we may plainly see, that such as have not their sins pardoned, can reap small benefit by having their bodies after death buried in holy places." It says in the Golden Legend that the church the nun was buried in was a church dedicated to Saint Lawrence. 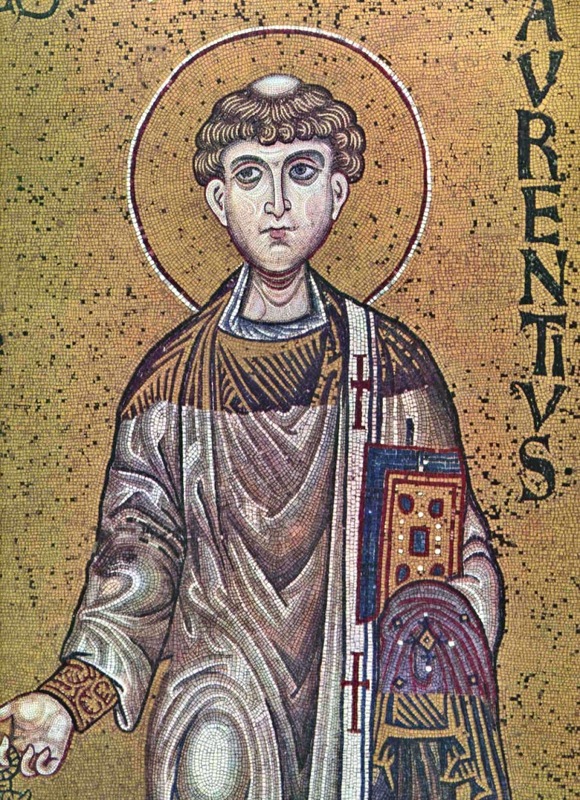 "When a great dearth was in the country, the man of God [Sanctulus, a Priest in the Province of Nursia] being desirous to repair the Church of Saint Lawrence, burnt before by the Lombards, he hired for that end many cunning workmen and diverse other laborers, who of necessity were daily to be maintained, but so great was the scarcity, that he wanted bread to relieve them; whereupon his workmen cried out for meat, because they were faint and could not labor. The man of God, hearing this, gave them comfortable words, promising to supply their want; yet inwardly very much was he grieved, being not able to perform what he had said. Going therefore up and down in great anxiety, he came to an oven, wherein the neighbors that dwelt by had the day before baked bread, and stooping down, he looked in, to see whether they had by chance left any bread behind them, where he found a loaf both greater and whiter than commonly they used, which he took away, but yet would he not by and by give it to his workmen, lest perhaps it belonged to some other body, and so might as it were, of compassion to other, have committed a sin himself. And therefore he did first show it to all the women there about, inquiring whether it were any of theirs, but all denied it, saying that they had all received their just number of loaves. Then the man of God in great joy went with that one loaf to many workmen, wishing them to give thanks to almighty God, telling them how his goodness had provided them of necessary food; and forthwith he set that loaf before them, whereof, when they had satisfied themselves, he gathered up more pieces of bread which remained, than the whole loaf itself was before in quantity. The day following, again he set it before them, and again the pieces remaining were far more than the former fragments. And so, for the space of ten days together, all those artificers and workmen lived upon that one loaf, and were very well satisfied, some thing remaining every day for the next, as though the fragments had by eating increased." It says in the Golden Legend that the Priest Sanctulus, upon hearing of the hunger of the workmen, prayed to Saint Lawrence for help, and then discovered the loaf. 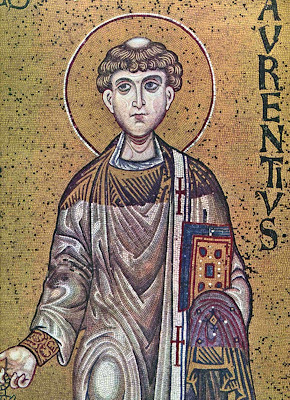 "Once a certain priest was repairing the Church of Saint Lawrence, and one of the essential beams was found to be too short for its span, therefore the priest prayed to Saint Lawrence asking that the Saint who had seen to the well-being of the poor would help him in his poverty of good lumber. And the beam grew in length so suddenly and significantly that it had to be cut for it was too long. The priest took the remainder, parted it into many pieces which he distributed among the faithful and by venerating the wood many were healed." The holy Bishop Fortunatus of Poitiers (530–600), a contemporary of St. Gregory of Tours, a poet and the hymnographer who wrote the services for St. Martin of Tours, witnessed a man suffering greatly with a toothache who only touched this wood and was instantly healed. In the Church of Saint Lawrence at Milan was a chalice of crystal, marvelously clear, and as the deacon bare it on a day suddenly to the altar, it fell out of his hands to the ground, and was all broken. And then the deacon, weeping, gathered together the pieces and laid them on the altar, and prayed to the holy martyr Saint Lawrence that the chalice that was broken might be made whole again, and then it was found all whole.